The Turkish President Recep Tayyip Erdogan was on two-day official visit of India. Both the countries have pledged to improve their bilateral ties in the field of economic, political, diplomatic etc. India and Turkey’s relations as a topic of international relations are very important for IAS Exam. The IAS aspirant should not skip to study during IAS preparation. The Turkish President Recep Tayyip Erdogan during his two-day official visit to India determined to enhance bilateral relations with India and will take measures to ensure this. This is the first kind of trip at the presidential level from Turkey to India in the last seven years. While welcoming the Turkish President, the Prime Minister of India has emphasised the importance of bilateral ties between the two countries. The IAS aspirant must prepare this topic during IAS preparation and it can be asked in IAS Mains Exam 2017. During the bilateral talks between the leaders of both the countries discussed the key issues covered the efforts to boost bilateral ties, fight against terrorism, the deterrence of Gülenist Terror Group (FETÖ) activity in India and India’s membership of the Nuclear Suppliers' Group (NSG). Both the countries are determined to combat terrorism in any form. They stressed on the issue of global terrorism and mutually agreed upon to condemn the 'use of double standards' methods in fighting terrorism and also agreed to strengthen cooperation in an effective manner in dealing with the menace both bilaterally and at multilateral fora. Both the countries also agreed to adopt the early conclusion of negotiations on the Comprehensive Convention on International Terrorism (CCIT). The CCIT was proposed by India on the global level in 1996 but after two decades its conclusion is yet to be adopted. Indian premier express his gratitude towards Turkey and thanked Erdogan for Turkey's support for India's membership of the MTCR (Missile Technology Control Regime) and its interest to join the Nuclear Suppliers Group (NSG) as well as Wassenaar Arrangement, an export control regime. The Turkish President also expressed his support for India's bid for membership of the Nuclear Suppliers Group (NSG). Both the leaders of the country emphasised on the need for comprehensive reform of the United Nations including expansion of its Security Council to make the body more representative, accountable and effective. Erdogan also showed his keen interest in the free trade with India and the two leaders of both the countries resolved to expand trade ties and decided to encourage business efforts to accomplish a level of at least $10 billion of bilateral trade by 2020. On the current status of bilateral trade between the two countries, Erdogen said that the turnover of around $6 billion in bilateral trade is not justified for the convergences of both the economies. 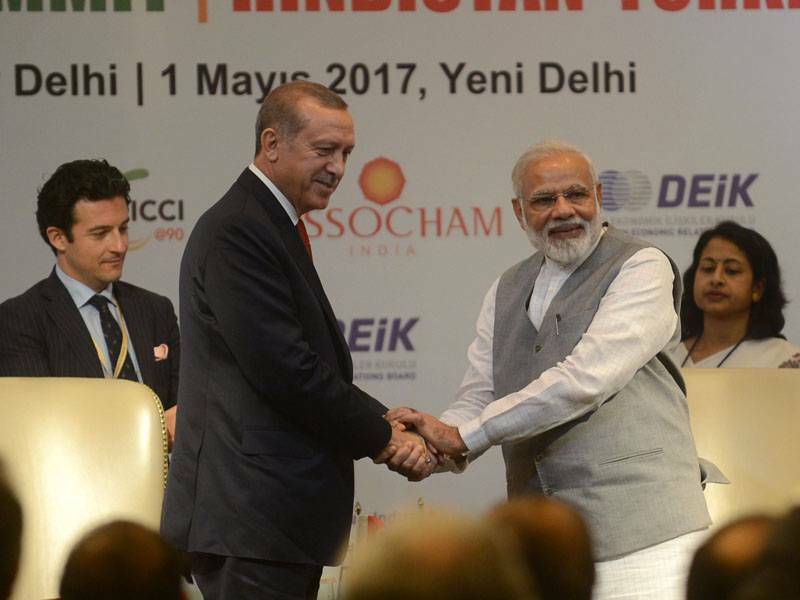 Indian premier welcomed Turkish investments which will help India to achieve its ‘Make in India’ mission. The Turkish President while expressing trade gains between the two nations said that India's infrastructure requirements and its vision of developing smart cities match well with the Turkish expertise in the construction industry. They also agreed on mutual cooperation in the field of information and technology (IT), pharmaceuticals, health and tourism which are favourable to the growth of bilateral trade between the two nations. When they came into the cooperation in the field of energy, both the premiers have agreed to improve cooperation on hydrocarbons, renewable energy (solar and wind) and energy efficiency. Erdogan also invited the President Pranab Mukherjee and to Modi for visiting Turkey at mutually suitable time. PM Modi has accepted the invitation. Cultural Exchange Program for 2017-2020. An agreement between the Government of The Republic of Turkey and the Government of The Republic of India was signed on productive occupation for family members of the members of the diplomatic mission or consular posts. Both the leaders agreed on the ties of the culture of Sufi traditions and the exchanges and influences of the Turkish language on Hindi and vice versa among other linkages which provide a deep connect with the people of both the countries. There was no mention of Kashmir issue during the bilateral talks but Erdogan had expressed his view earlier that India-Pakistan dispute on Jammu and Kashmir could be resolved through “multilateral talks” involving Turkey’s participation. According to Erdogan, there should not be allowed more casualties to occur and the relation between India and Pakistan can be improved through multilateral dialogues for this we can be involved. At the same time, India has rejected Turkey's proposal to mediate talks between New Delhi and Islamabad because Turkey has supported Pakistan's position on Kashmir earlier at different forums. In the last few years the bilateral trade between India and Turkey has been declining. This particular visit of Turkish President to India will revamp the old ties between these two countries. While elaborating their own capacities, the Turkish President has expressed his cooperation in various fields to India seems quite encouraging for India. India should look forward to maintain the ties between the two nations and explore the areas where these two nations can gain from each other.